How Much Does it Cost to Develop an MVP for Mobile App? You might be having a brilliant app idea at the back of your mind that you want to finally execute. But just hold on for a minute and calm down your nerves. Before you implement your plan, think over it again. Are you damn sure that your app idea is 100% unique and authentic? Are you absolutely convinced that your mobile app will receive a grand welcome in the market and that the users will start downloading and installing it as soon as it is unveiled? No, certainly not. Nobody in the world can predict what status your mobile application would hold in the future. So, if you are not prepared to take a risk and rather approach a safer route, then it is highly recommended to opt for building an MVP or the Minimum Viable Product of your app. Of course, it would cost you some additional bucks but you don’t have to launch your app with a stressful mind and perceive which way the wind blows. What is an MVP and why is it so important for your mobile application? A Minimum Viable Product or simply MVP can be defined as a set of most essential and minimum features that allows the development team to check the viability of the product and determine the validity of the idea through customer feedback and application usability. If we go through a few reliable statistics, then it would be known that 74% of the startups fail due to premature business strategy, which is not going for MVP before the app release. Similarly, 29% of the startup fails because of financial crisis. Let’s have a quick look at the cost estimation of developing an MVP for some of the most popular and widely used applications in the global scenario. Take such as Twitter. Now, if you ask the price estimate for creating an MVP similar to twitter, then you would have to pay $10.000. Similarly, if you are planning to launch an MVP for an app same as Facebook, be ready to pay $15.000 for its prototype. Please don’t misinterpret it with the cost of developing an entire mobile app; we are only emphasizing on the Minimum Viable Product here. The cost of developing a Minimum Viable Product or MVP for a mobile application depends on a number of variable factors. The factors are more or less similar to creating a full-fledged app, which is ready to be launched. In most of the cases, the App Development Companies charge their client based on per hour basis and multiply it with the total number of hours spent on development. The Minimum Viable Product chiefly depends on the complexity of the application idea. If the app idea would be challenging, so would be the MVP. You have to primarily decide what are the most important key features that you want to integrate in the app initially through an MVP. Let’s suppose say you are building an MVP for a cab booking app. Here apart from the registration process, third-party implementation, payment gateway, database encryption and a powerful admin panel becomes necessary to include in the MVP. The best part of the job would be categorizing the app features into three categories like must to included, nice to include and not include at all. You should be able to answer the question as how would your app prove helpful for the end users. Make sure the first version of your MVP is simple having basic features and functionalities, Later on you can go on with collecting the data and more complex versions. The scope of MVP also depends on the business requirements. You need to work on product development and customer development simultaneously. You also need to consider the cost of MVP design and its difficulty and so it is advisable to plan this important aspect in advance. Here, we are talking about the User Interface. Always note that the first initial design has a separate cost. Try to keep the design simple and straightforward that is easily understandable. In addition, you also have to design an attractive user experience design as well. The main components on which the UX design of the MVP depends are the preparation for the design, the wireframe, the mockup and lastly the interaction within the page. In the first stage, you have to begin with the initial preparation of the design. It would probably include a few meetings and discussions with the team members on how to proceed with the task and then take on the next step, which is wireframe and mockup. The wireframe is the skeleton or the basic structure of the MVP design. Here you prepare a rough layout of the navigation screen and other important elements. 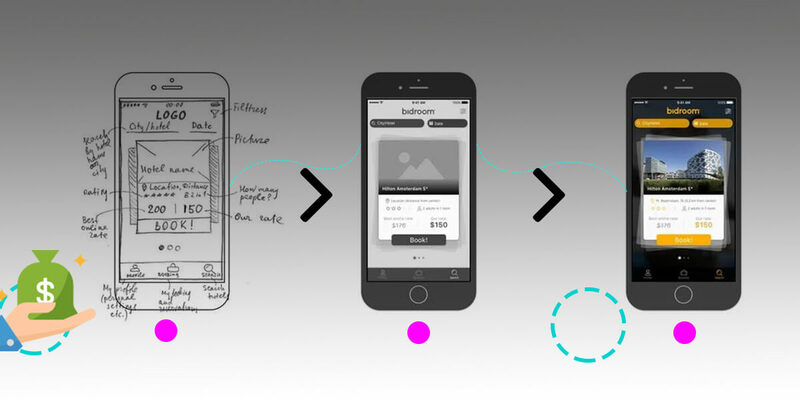 You can take the help of tools like Bootstrap for designing the wireframe. The wireframe usually takes around 16 to 20 hours and cost around $400. In the next stage, you proceed with the mockup, which is a kind of prototype and is one of the essential steps of the designing process. Here you present and design the MVP based on the ideas to make the client better understands, on what you are trying to do. If you are familiar with designing tools such as Adobe Photoshop or Corel Draw, then designing the mockup would become rather easier. As far as the time consumption is concerned, it takes around 40 hours and would cost around $1200. In the last section you deal with the interaction within the page. After building the mockup or prototype, you have to think about improving the interaction with the page. It helps to better the user engagement. The next important criteria that would play a pivotal role in determining the cost of an MVP is the technology stack. If you are an alien to this term, then do consult with the development team and ask what is best suited for your project. It would be best recommended to opt for customizable solutions that you can easily implement. Another important decision here is regarding the choice between the native and hybrid platform as you should know, which is most favored for your project. This question also props up when you are developing the last stages of the app and you also have to take the same decision while developing an MVP of the app. Both have their pros and cons, However, hiring a professional App Development Company is much more helpful as it has the in-depth expertise and a highly proficient team to cater the services. The freelancer though would cost you economical will not offer the same level of project delivery and as a result, your app will hamper in the later stages of the development. Secondly, freelancers are not available all the time to answer your queries regarding the project. One of the crucial decisions that need to be made is at what stage you would be launching your MVP in the market to get a feedback from the users. Yes, to be true it would have an impact on your pocket. Do you want to release your app MVP only after adding two or three functionalities? Unveiling a completely prepared MVP will definitely cost you more than presenting it in the initial stages. The Minimum Viable Product is one of the most essential parts of any mobile application, which can also be considered as the base foundation of the app. You develop an MVP product and then launch it before the targeted audience to know if your app idea is valid to be executed further. So, when you are preparing or planning a budget for your mobile app development, make a separate estimation for the MVP creation as well. While deciding the MVP cost, you have to consider a few vital factors for the successful launch of your product. If you are looking to get an estimate for MVP Development cost, feel free to get in touch with our team.